When I got started in networking, my education (like so many network engineers) was all about Cisco. All my networking courses in college, as well as my early networking jobs all used Cisco curricula and equipment, and valued Cisco certifications like the CCNA/CCNP/CCIE above all. It wasn’t until I had already been in the industry for about three years or so before I even got my hands on a Juniper device, and by that time, my IOS habits had taken root in my muscles, which made the new set/delete style of Junos configurations even more strange. While my Junos experience never came close to exceeding my IOS/NXOS experience, I grew to appreciate some of the subtle advantages that Juniper bakes into its software. However, getting this experience meant I had to work that much harder to get my hands on lab gear to make it more a part of my day-to-day experience. These days, it’s way easier to get started with Junos. You don’t have to wait for someone to get you some lab gear - you can set up a virtual lab right on your laptop. While there are a few places you can do this, one of the best and most up-to-date is the vQFX Vagrant repository. 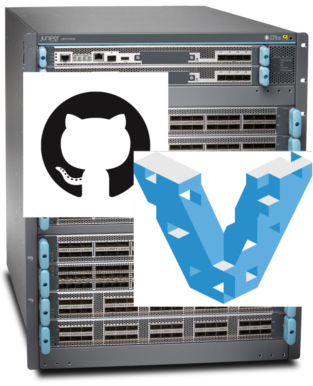 This repo contains multiple directories for running a virtualized version of Juniper’s QFX switch ranging from the simple single-node deployment, to a full IP fabric. This means we can do a whole lot of Junos learning, right on our laptop, for free. Virtualbox - this is a hypervisor that allows us to run vQFX in a virtual machine. Git - this is a version control tool we’ll use to download the vqfx-vagrant repository, which contains all needed configurations for running this image. Once you’ve installed these three pieces of software once, you can then take advantage of the myriad of repositories on the web that contain Vagrant configurations for running virtual network devices - this isn’t limited just to the vQFX environment we’ll use today. As mentioned before, the vQFX Vagrant repository contains a number of directories with configurations for running various vQFX topologies. You may also notice there are Ansible playbooks in these directories. These are very useful for building complex configurations using virtual images for deeper learning. However, to keep this post as simple as possible, we’re skipping that part for now. This guide is intended to get you started with a single, vanilla Junos instance as quickly as possible. There’s a file in this directory called Vagrantfile. This contains instructions to Vagrant for downloading and configuring a virtual machine. What this means for us is we don’t need to click through GUIs to make sure our VM is configured correctly. Just run vagrant up --no-provision and Vagrant will take care of everything for us. The --no-provision flag instructs Vagrant to skip the Ansible provisioning process so we can just get straight to playing with Junos. We’ll follow up this blog post with another one that focuses on the various configurations made possible via Ansible in this repo. You can safely ignore the “Machine not provisioned” message you’ll see after this command; this just means the Ansible process was skipped, and we have a vanilla Junos environment. ==> vqfx: Successfully added box 'juniper/vqfx10k-re' (v0.3.0) for 'virtualbox'! ==> vqfx: Machine booted and ready! vqfx: the guest additions and repackage the box to continue. vqfx: in which case you may ignore this message. ==> vqfx: Machine not provisioned because `--no-provision` is specified. Now that we have a vQFX instance running, we can run vagrant ssh to SSH to the virtual machine and get a handle on the Junos CLI. I hope this was a helpful and simple guide to getting a working Junos environment to play with within a few minutes. It doesn’t make sense in today’s world to wait for lab gear to even get a basic experience with new software, and I hope this helps you kick start your learning. Happy labbing!